Basically for starters I chose a bright red, green, yellow, and blue. This makes my point well, but looks pretty bad. I find it quite harsh. Do you have any ideas for how to improve this? My thought, not yet implemented, is to do black, gold, white, and purple. The problem with your red, green, blue, yellow set is that is all the colors. You can make every color by mixing those. A more limited color set will likely look better. Red and green are not directly contrasting colors. You would want red and cyan. Other contrasts are blue and yellow, or green and magenta. But you are talking about pleasing the eye. That is art, not science. So you should consider just trying a few color combinations until your eye is pleased and your scientific point is still expressed. If you create 4 squares in a grid in a graphics tool (on the background color you will be using) and work with various colors and tones until you have a set that is both distinctive from each other yet pleasing to look at together that will likely get you the best result. 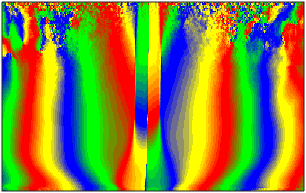 There are online tools specifically for designing color sets. 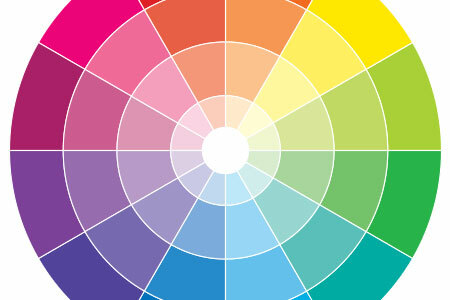 You can use a basic color wheel to see which colors contrast and choose the pairs you like best. Or you can use Palletton to choose four contrasting colors. Just move the outer pins around the color wheel. They will always stay 90 degrees apart, thus giving you contrasting colors. Click on Tables/Export on the bottom right of the site to see a list of the colors in RGB and Hex values. I'm not sure your diagram has the correct colors next to each other. From what I read about appealing colors, Red and Green next to one-another is also hard on the eye. In 1885, W. Einthoven was the first scientist to study the chromostereopic effect. There is a difference between the visual and optical axes. Therefore, light from the fovea will hit the corneal surface at an angle, causing a prism effect. Blue, with its shorter wavelengths, is refracted more than red with its longer wavelengths. Blue light is focused toward the nose, making it appear farther than red which is focused toward the temple. Not the answer you're looking for? Browse other questions tagged color color-theory contrast or ask your own question. How to select colours that match each other? 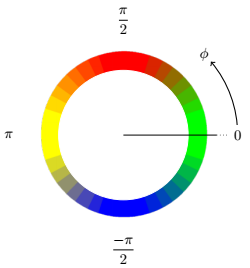 Given a number, how to find that many colours that are well-distinguishable? How do I find a range of colors (ex. different blues) that will contrast well with another range of colors (ex. reds, yellows etc)? How do I refer to a color in a text? What naming system do I use? Are these Pantone colours all the same? Are the primary colors (red, green, and blue) the most contrasting colors?